Oh, dear delicious pizza! 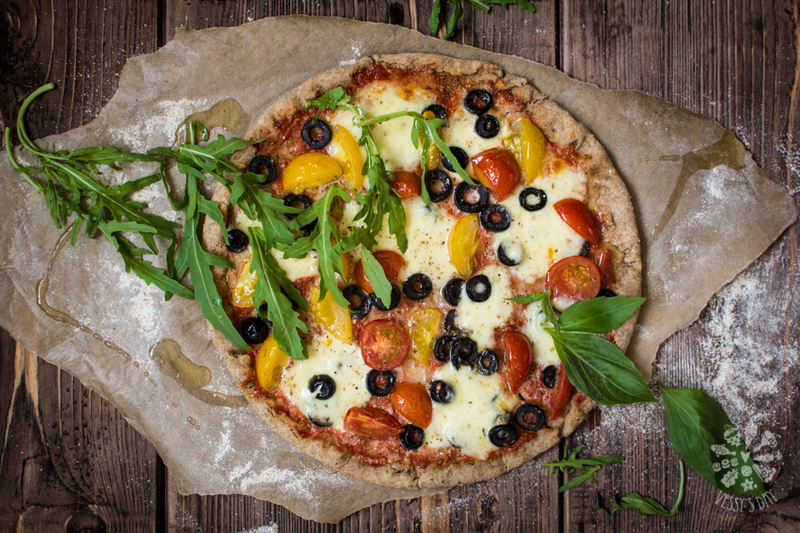 This pizza is not only super delicious but it’s also a bit healthier than any other regular pizza. The dough is made of black wheat organic flour and rolled into a thin layer, so we don’t feel guilty about having too much dough. Usually when I make bread or dough out of whole wheat flour, or mix different healthy flours, like rice, nut, quinoa or buckwheat, I add an egg or two to keep the dough from crumbling and falling apart after baking. 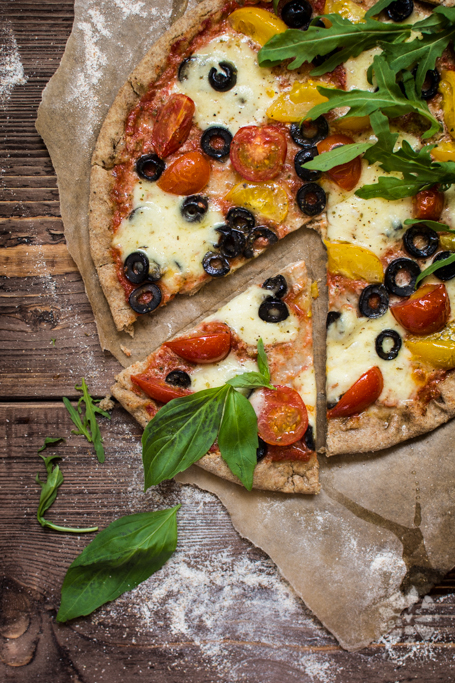 If you prefer to have an egg-less dough, feel free to skip it, but keep in mind that your pizza will be a bit delicate and will most probably brake easily. Prepare the dough:In a large bowl, add the black wheat flour, rice flour, easy blend yeast, salt and pepper. Mix to combine. In a small bowl add water, sugar, olive oil and the egg. Add the wet ingredients to the flour mixture and knead until you form a nice ball of dough, a bit hard to the touch. Push the dough with the tip of your finger, your finger will make a hole in dough. You will know the dough is ready if the dough brings back it’s round form, and your fingerprint hole disappears quickly. Transfer the dough to another bowl, greased with olive oil. Cover with a clean towel or plastic wrap and set aside to rise. Once the dough doubles it’s size, knead again and divide into two equal balls. Preheat your oven to 180C fan-forced (350F). Roll each ball into a circle and place on a greased pizza baking sheet. Brush the top of the rolled pizza dough with olive oil. Spread a thin layer of the tomato pure over the pizza dough, sprinkle with cherry tomatoes, olives, season with salt, pepper and basil. Top with the mozzarella slices and bake for about 25 minutes. Once ready, remove from the oven and sprinkle a little bit of olive oil on top. Serve hot from the oven with a side of rocket.